Blake & Raymond was the glove manufacturing company of Frederick Blake and Edward Raymond. They were certainly operating in 1904 in a newly-erected glove factory lying between Vicarage Street and Market Street as shown in the advertisement below. In February 1908 Messrs Blake & Raymond, glove manufacturers of Vicarage Street, were summoned under the Factories and Workshops Act for employing three girls under the age of 18 after eight o'clock in the evening. At the Borough Petty Sessions the defendants pleaded guilty and were fined £1 and costs in each case. Apparently in 1908 Blake & Raymond were persuaded by a salesman to begin the manufacture of mocha leather (a soft, thin, suede-finished glove leather usually made from sheepskin) by using a 'secret' formula in the tanning process. It turned out that the process wasn't a secret but was patented. Nevertheless the process was a complete failure and Blake & Fox lost "fifteen hundred dozen skins". A court case resulted in 1910 but was settled out of court. In its edition of 10 April 1909 the Western Daily Press reported on a fire as follows "About three o'clock yesterday morning a fire broke out at Yeovil, resulting in the total destruction of the premises of Messrs. Pratt & Co, chemists' sundrymen, and a considerable portion of the adjoining premises of Messrs. Blake and Raymond, glove manufacturers, Rickleford. The fire brigade were summoned and survey succeeded in saving the surrounding property. Fortunately, there was no wind, or the damage would have been considerably greater, owing to the close proximity of other property. As it is, the damage is considerably over £1000. Messrs. Pratt & Co lost everything, including the whole of the contents of their offices, while Messrs Blake and Raymond have just had a new and valuable machinery fitted up, and the whole of this has been destroyed, as well as a quantity of valuable leather, while several of the workmen have lost their tools. The origin of the fire is at present unknown. The property is insured." 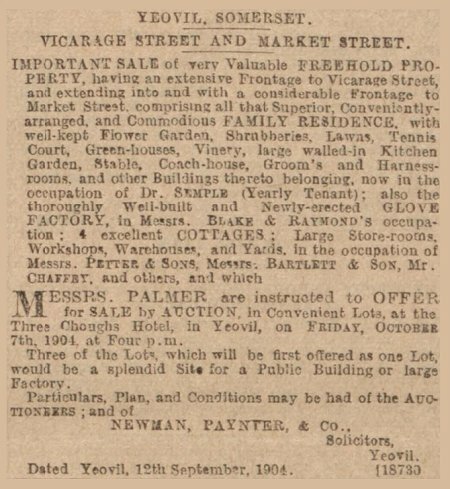 A notice of sale placed in the Western Gazette's edition of 23 September 1904 which included the "newly-erected glove factory in Messrs Blake & Raymond's occupation."